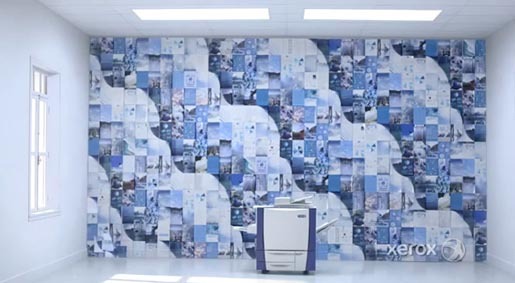 Xerox is running “A World Made Simpler by Xerox”, a television commercial using mixed media project that tells the story of Xerox’s services, technology and expertise through constant movement and playful applications of paper. It was nearly 75 years ago when Chester Carlson invented xerography for one simple reason: finding an easier way to replicate and share information. Fast forward to today, and Xerox remains true to this heritage: providing simple answers to complex business problems through diverse outsourcing services, innovative document technology and brilliant brain trust of Xerox people. The World Made Simpler campaign was developed at Y&R, New York, by executive creative director Jim Radosevic, art director Kleber Menezes, copywriter Corey Rakowsky, executive producer Robert Beck and producer Craig Sklaver. Filming/animation was produced at Psyop via Blacklist by director Cisma and Psyop, with creative directors Laurent Barthelemy, Denis Kamioka, Psyop executive producer Lucia Grillo, Blacklist executive producer Adina Sales, producers Ave Carrillo and Erik Gullstrand, live action producer Gabi Hahn, VFX supervisor Joerg Liebold, designers Naomi Chen, Eunice Kim, editor Sam Goetz, storyboard artist Ben Chan, lead technical director George Smaragdis, animation team Ryan Moran, Helene Park, Sophie Gate, VFX team George Smaragdis and Jordan Harvey, lighting artist Fabio Piparo, lead tracking artist Bogdan Mihajlovic, compositor Herculano Fernandez, Flame artists Aniello Zampella and Fabien Coupez. Live action was produced at Parnoid BR by executive producer Egisto Betti, production manager Gabi Hahn, first assistant directors Camila Andreoni, Renata Salloum, director of photography Pierre Kerchove, and art director Olivia Helena Sanches. Stop Motion was produced by Fabio Yamagi at Banzai Studio.